Finally Friday!! 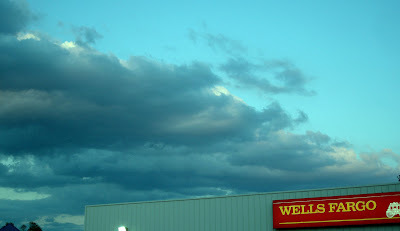 My favorite day of the week=) today's photo was taken at Wells Fargo in downtown Terrell as some clouds were moving through. Looks like rain clouds overshadowing the lovely puffy white clouds! NIce bluish green sky shot at Wells Fargo! You have captured great shades of blue there. Happy SWF! Beautiful shot! I'm orginally from Dallas, this was a nice visit down memory lane. Mine are up HERE and HERE. If you get a chance ;) Happy SWF! Nice sky there over Texas!!! I love the clouds = cool! Beautiful sky. I love the shade of blue. Happy Halloween!!! Are you expecting lots of monsters?? That jade sky is glorious. I really like the colors in both the clouds and the sky. Nice contrast with the Wells Fargo sign. I love your shot, Brian. I did, however, laugh at the bank sign in it. . . . How is WF doing, anyway? Thanks for visiting Norwich Daily Photo and leaving your comments. Have a lazy Sunday!